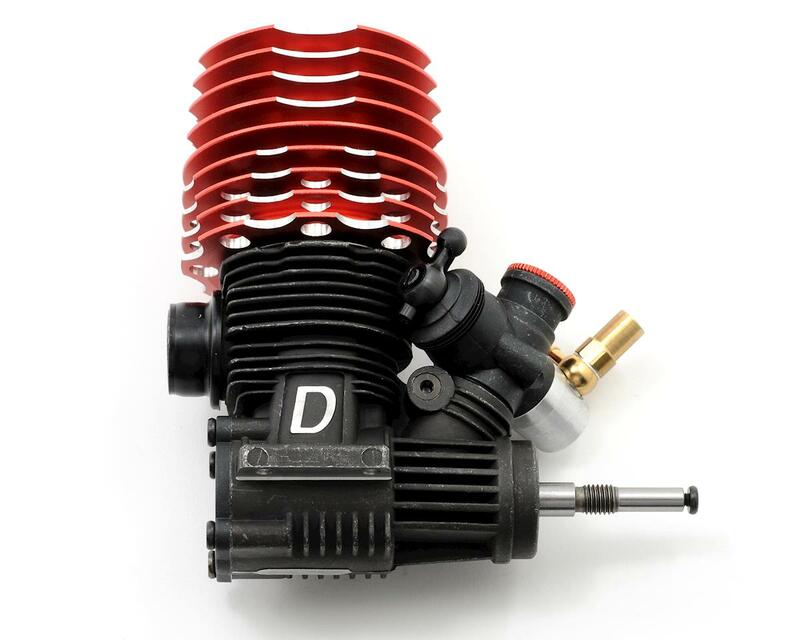 This is the Dynamite Mach 2 .21 SG nitro buggy engine. 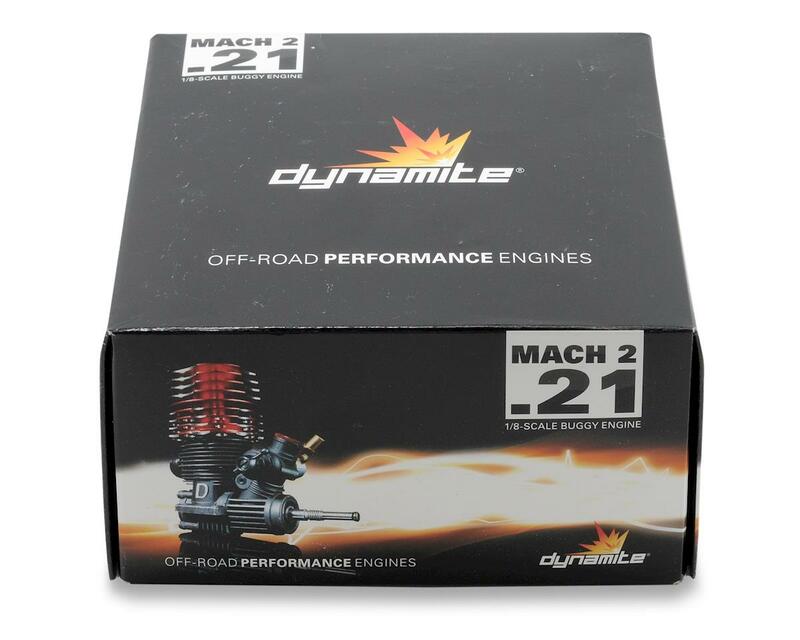 Dynamite's Mach 2 series engine line ignites the industry with the .21 SG nitro engine. 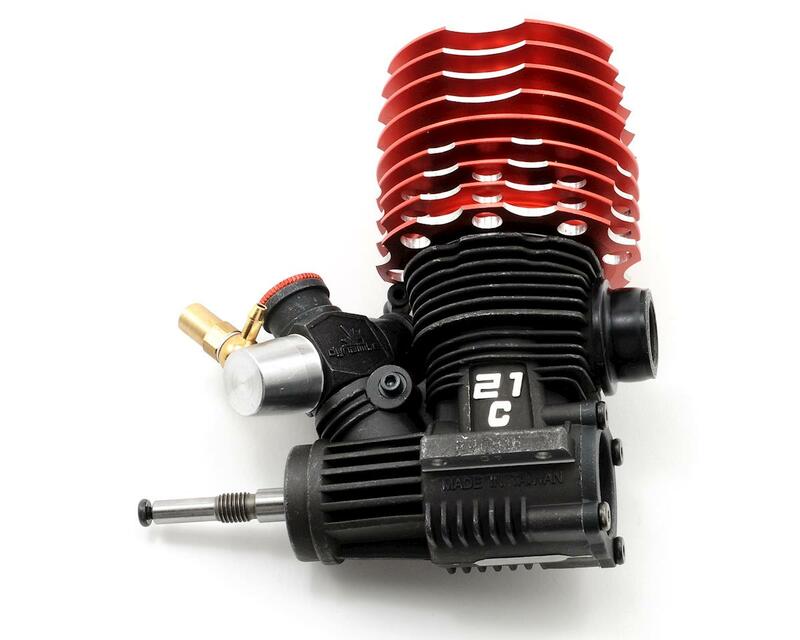 Known for explosive power, reliability and all-out performance, Dynamite engines are becoming the engine of choice for many RC sport racers. 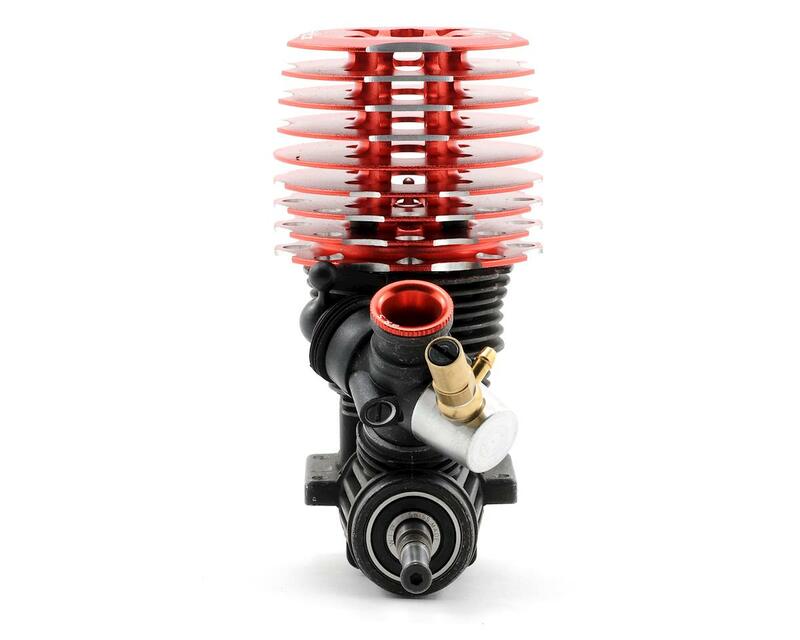 The 13mm turbo ported crankshaft along with the ABC 6-port piston and sleeve allow this engine to deliver superior horsepower, high torque and extreme efficiency matched only by engines at much higher price points. The Dynamite .21 SG incorporates the technology and design advances developed from the Dynamite Platinum .21 XP in a sport version. 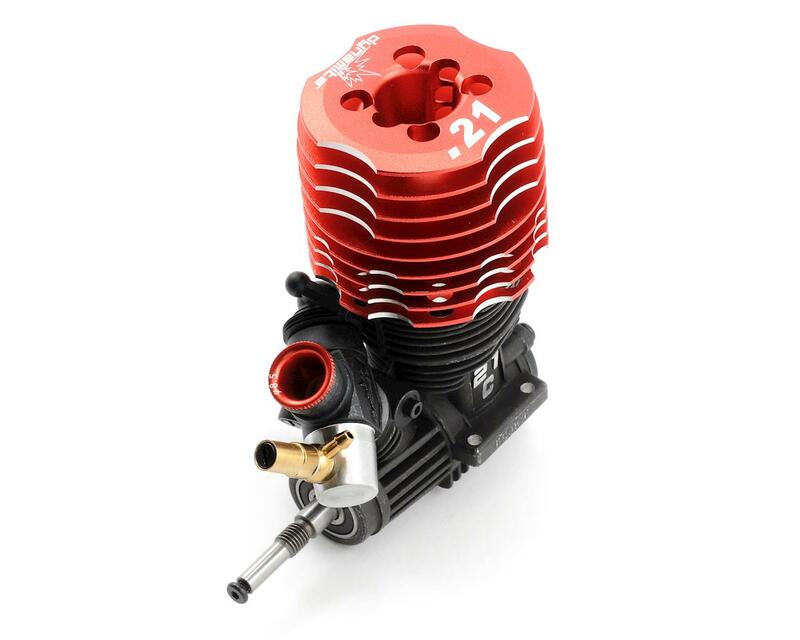 Whether you're upgrading your existing nitro vehicle or looking to build a competitive racer, look no further, the Dynamite .21 SG engine has everything you need to be successful in the backyard or on the track. Just thought I should go over my experience with the Dynamite Mach 2 .21 sg buggy engine. I found a 10% off coupon which brought my cost to $117.00, so great price. I installed it on a Team Durango DNX 408V2 1/8 scale buggy. It cranked up on the first try using my Ofna blue starter box. I ran it with the factory settings on the carb for the first 7 or 8 tanks very slow using an old sock around the cooling head to keep the temp up around 200f to 210f. at that point I started leaning out the high speed needle a little at a time to just sneak up on the tune. I ran a total of 14 tanks of fuel for the break in. At this time I have just over 4 gallons of 25% VP fuel through this engine. It has never quit before running out of fuel, never had any trouble starting and always had plenty of power. I use a Hobbyking med. hot glow plug that seems to last and last, one lasted over a gallon of fuel. So how do I feel about my Dynamite Mach 2 .21 sg buggy engine, I love it. Would I buy it again, u bet I would. P.S. at the track I keep up with other guys running $400.00 dollar engines, when they ask what I have done to my engine, I just smile. I have run about 8 gallons on mine before done. Byrons 25 mediun plug Losi 8t 2.0. Decent power, decent run time. Ok bottom ok mid ok top w stock 007 losi pipe. My pit guy is on his 6th one. 4-5 gallons re-shimmed w/30%, 5-10 w/20-25%. This motor works really well in a losi 8b 2.0. he has ran these motors for the last two years with about 50-60 gallons on them. 7-9 minutes in buggy or truggy. A tad weak in truggy if you need bottom end, Killer bottom end in buggy. Turbo head gives a little more run time, and alot more top end beware even reshimmed and running 30% it will predetonate, causing pitting and premature motor failure. 20% will not cause this reshimmed. Mid to top in buggy is very surprising also LOUD. for 120 bucks there isnt a motor out there than can compete. Ran these in Rc pro series, nct's, club races through out the northwest. I have seen about 20 of these at the local track and one of the only problems is the carb o ring like to go bad. Buy a spare set for 6-7 bucks. Follow break in and run medium plug and you wont be disappointed. Spare venturies and magnesium head lightened impressive. Install 2 ceramics and turbo head for under 200 bucks this thing is the loudest .21 around. Jammin pipes work extremely well. JP 1 JP 2 JP 3 JP 4 for fuel economy. My experience says i like the Jammin pipes alot more than the dynamites. Re pinching works for 1 1/2 to 3 gallons w/ the 3 He did. I just bought a .26 and oh boy A main here I am. Double check the low end needle out of the box. Mine was almost totally closed not allowing fuel to enter the carb. I richeded the low end until the idle was good and leaned the high speed as normal after breaking in. Idles all day long. Gets good run-time and has decent power. I have been running .28's for a while so I am used to a little more power. It performs better than my Novarossi N21 BF for less money. Will update on longevity after more run time. Good engine seems a little lacking on the fuel mileage overall a great engine for the money. I would recomend this to other people looking for a lower priced club race engine. Make sure that by the time u get the engine u change the 4 backplate flat head screws and replace them with quality screws (I prefer using socket type). The rear bearing size is 13x24x6 and NOT 13x25x6 as it is written in the manual that comes with the engine. I mean that the manual has the code (DYN6012) but mentions the wrong dimensions of the bearing (13x25x6),by insertung he above code at dynnamiterc.com u will found out that the code is OK and it stands for the (13x24x6) bearing -//- This motor is maybe the best value for money motor. 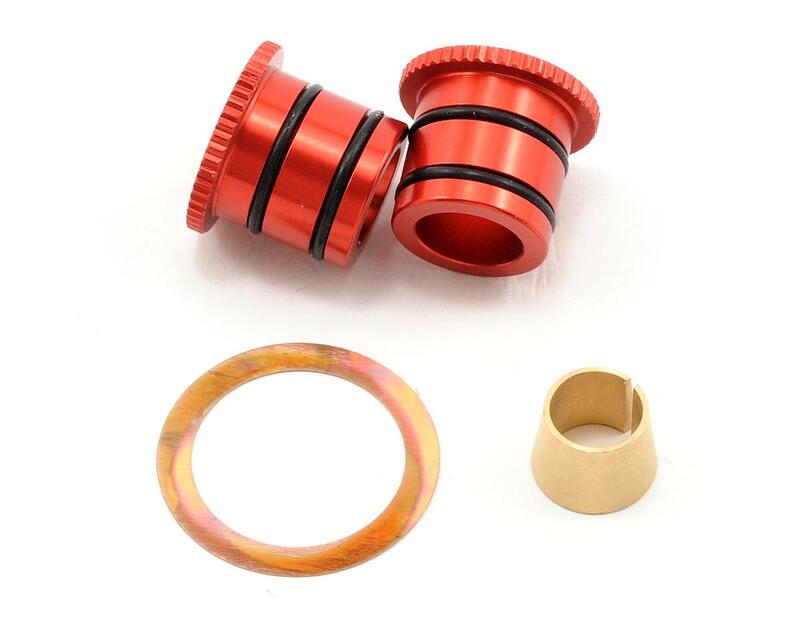 It uses the same Bearings with the Mach 6,u can find top quality bearings (Boca) for 30Euros both. Since it's a 7port engine (6+1) u should combined it with the suitable pipe,i am qurrently using the mid-range 053 dynamite pipe with the 7.5mm venturi,the engine gets crazy at low rpm. Finally,it's ,without a doubt, the best motor for replacment on RTR cars or even for a practise engine. This budget motor of $120 delivers incredible power from bottom to top with Losi tune pipe RE11. I have ran in pro class with Losi 8ight 2.0 which is very consist power without needing tune up. Most guys run NovaRossi, OS, JS, and all top notch motor etc. I've carried the same speed as they do. They were pretty impressed how this Dynamite preforms at the track when does doubles or triples so easily out of the corner speed. I used ODonnell plug HOT with 30% BYRON fuel. Guys! here is tips for tune up setting: BOTTOM idle: 4 1/2 turn out, TOP idle 2 1/2 turn out (from flesh) also using 7.5mm restrictor. KEEP it runs at 230 temp and break-in 3 tanks. I used 1 gallon and its compression still strong. Then YOU enjoy the most screaming .21 coming up at the STRAIGHT AWAY at the track! Lets found out how long it will last!?! To be continue. A guy at our track put the losi turbo head on this motor with 30% fuel and boy oh boy! Danny you are crazy u broke it in completely wrong. i let mine idel through 4 tanks then easy throttled it and never had a problem out of my motor. i got about 5 gallons on it and it still has alot of compression the bottom end is very finicky but over all the motor is good. the only problem i have with it now is that it seems it want to flame out after about my 3rd come in for refuel. but for the price its a really good motor. love it -//- this is one of the best motors i have had in a while besides the grp. this motor idels really well, has great power will run with the best of them and it last a while on fuel. i think im getting 8 to 9 min on one tank. has everything you can think of. in my opion i will stick to these till they quit making them. So you can put a losi turbo head on it? Does it need re-shimming? Will it give it better fuel onconomy or better power? Good engine for the price, Nice power Decent mileage, I just wouldn't expect to get much more than 5-6 gallons though one. this is a pretty good motor for 119.99 is not a bad price. my motor lasted me about 5 gallons. i did notice that this motor likes to run around 260-270. im thinking on pinching it or just buy another motor. over all this is a good motor. Decided to pick one up for club racing and a back up engine. I was very surprised of how good this engine is and I'm going to buy one more. I use the 053 pipe with engine and after trying other pipes I think the 053 is the best one to run. I got this motor, pretty one, broke it in to the EB Mods method. Raced/Practiced with it, did ok in my buggy. Now I took it apart and looked at the con rod and the hole where the wrist pin gos through was bent. I dont wanna bash Dynamite but the price of the engine explains the quality which is a 3/10. I got it for practice motor. But the quality of the motor is somewhat poor. It did pretty good against the top motors but wouldnt recommend for people who want to actually race. And for those wanting a vid heres mine.